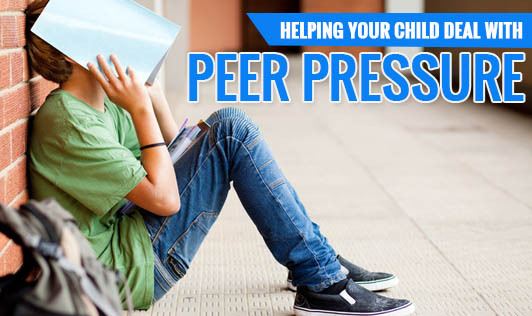 Helping your child deal with peer pressure! As a child becomes an adolescent, he or she relies on friends for everything from companionship to compassion. They come to believe that others their age are better able to provide understanding and sympathy. Also, they find it comforting to be a part of a peer group that decided for them how to think and react.Children strive to look, talk and act like others their own age. In an effort to win peer approval, they surrender to pressures to do what their friends are doing. These pressures can become intense during middle and high school years. Sometimes, peer pressures can be a force for good if it encourages the adolescent to engage in healthy activities such as taking up a sport, working hard in school and so on. 1. Talk to your child and acknowledge that you understand that it is quite difficult to make decisions separate from his or her peers. But, let your child know his/her peers may respect and even admire the decision of not joining them in certain activities. 2. Be a good role model to your children as they often learn from what you do than from what you ask them to do. 3. Strengthen your connection with your child and he or she will be more likely to listen and respect your views and be better able to deal with peer pressure if he/she feels that you are a source of support. 4. Don't sweat the small stuff; make your stand on high risk peer behaviour. 5. Don't overreact as it may discourage your child from opening up to you about issues in future. 6. Encourage good decision making skills and the consequences of the decisions. 7. Help your child figure out what to say to his or her peers who are pressurising him/her to participate in high risk activities. 8. Take time to get to know your child's friends and assess whether they are good role models. By following these simple steps mentioned above, you can help your children deal with peer pressure and make a positive influence in their lives!